I have to admit that I have a bit of a soft spot for ESP guitars and this is definitely true for the ESP LTD H-101FM electric guitar. Back in the 80s I went through a rather tragic phase of loving everything by the American metal band Dokken. George Lynch their lead guitarist, in my rather young and naive eyes was the best guitarist in the world and I wanted to play just like him. As he played an ESP guitar I just had to have one too. Sadly I never managed to fulfill that dream and I am glad to say that my fascination with all things Dokken disappeared. 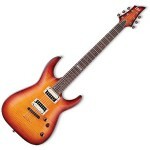 However, I still think ESP make some great guitars and that is especially true when looking at the ESP LTD range. The LTD range comes in a number of shapes and sizes but is definitely the entry level point if you want to buy an ESP guitar. As for the ESP LTD H-101FM guitar, well it could be viewed as the entry level guitar in the LTD range. However, don’t be fooled by the price this instrument really plays and feels like a guitar from a much higher price point. The ESP LTD H-101FM is hewn from a great piece of Basswood which although a relatively cheap wood for guitar construction does not lose anything in terms of resonance and feel. The body is finished with a great bit of flamed maple which with the antique sunburst finish really looks the business. In every way this is a solid guitar which has been well crafted. The neck is of a bolt on construction and is made from maple with a rosewood fretboard. The neck has the full two octave 24 frets and the contour of the neck fits squarely in the modern camp, being thin with a low profile. This really is a neck for the fast fret dancers amongst us! In terms of electrics the ESP LTD H-101FM is fitted with ESP LH-150 humbuckers in the neck and bridge position. The pick-ups can be accessed through a 3 way toggle switch and there is a master tone and volume toggle switch to control the tonal output. The strings go through the body and over a TOM bridge and tuners are standard ESP. When playing the guitar you can be mistaken for thinking that you have got more guitar than the £299 RRP suggests. For the price I have to say that I absolutley love the ESP LTD H-101FM it plays well stays in tune and the two ESP LH-150 humbuckers are great pick-ups which allow a lot of experimentation with the sound. Whatever you play I think that this guitar is versatile enough to cope, a real guitar for all seasons. I think that the only think that might put you off is the lack of tremolo unit but if you want one you won’t be buying this guitar. There really is not much more that can be said about the ESP LTD H-101FM electric guitar. It looks good, I have to admit I would go for the antique sunburst, plays even better and sounds fantastic. What more can you ask of from a guitar. Now it just remains for me to grab my ESP LTD H-101FM crank the amp up to 10 and rock out with some Dokken! If you are looking to buy the ESP LTD H-101FM electric guitar then I can recommend Gear 4 Music where you can currently pick up this great guitar for £254 which is 15% off the RRP of £299.